9. 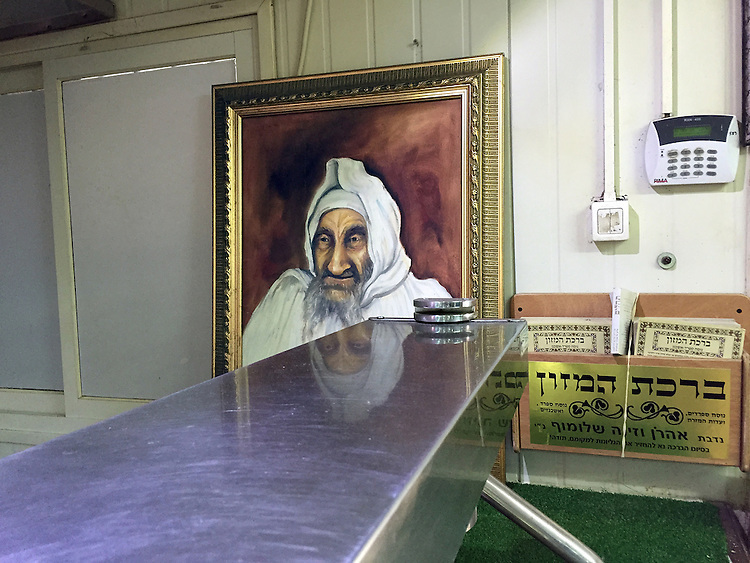 "Grace After Meals": placards at a roadside cafe, paired with painted portrait of Israel Abuhaseira, a sephardic rabbi thought to work miracles, Jordan Valley. Inside a cafe next to abandoned military tanks I found this surreal conjunction of imagery. A painted portrait, eyes reflected in the stainless steel counter, was the prominent fixture. Printed handouts were displayed next to it, labeled "Birkat HaMazon," which in Hebrew means "Grace After Meals." At the time, I had no idea who the turbaned man was in the imposing portrait. I thought he must be an Arab by the way he was dressed. And to add to my confusion, a dark-skinned waiter in the cafe was wearing a T-shirt that said "It Wasn't Me!" What was I to think? Nothing was as it seemed. Turns out the portrait is of a Moroccan Sephardic Rabbi named Israel Abuhaseira (1889-1984). Called "Baba Sali," this holy man and kabbalist was renowned for his alleged ability to work miracles.